Arc System Works' Arc Style: Soccer!! 3D is two weeks away from slotting its first effort past the eShop goalkeeper. 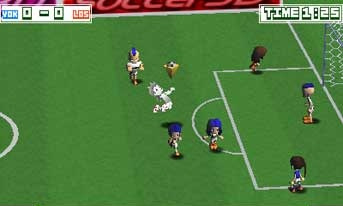 Or, in English, the 3D soccer game will hit the 3DS eShop in North America on 29th March. The sporty download will set you back $6.99 and includes the ability to customise players and kits, use your own photograph for a player face and play with other 3DS users with local multiplayer. You can see some footage of the game in this trailer below ahead of its release in a few weeks. It looks ok, but I don't think I'll get it unless it's a 9/10. Will be interesting to put this one up against Soccer Up! 3D. For a minute I thought this was another Art Style: game. Would've been one hell of a weird 'un! @portista: you don't need to get every single game, you know. That's a bit of a steep price to be honest. Honestly don't care too much about this, but I believe the same dev released a Billiards game on the Japanese eShop, and I want that, so hopefully this does well enough for them to release their other games over here. I thought the E-Shop trailer was pretty impressive for an Arc Style game. Still, i'll hold off on a review or two just to be on the safe side. Just hope it turns out better then their DSIware version which was just to easy to be any type of fun.